Wise Women Awards - Nigeria The Wise Women Awards recognizes the contribution that Christian women have made in the church and wider society. Amb. (Mrs.). Unyime-Ivy King is the Executive Director of the Save Our Women and Girls Foundation (SOW&G). The area of focus is to create social developmental awareness on issues that concern women and girls through counselling, mentoring, educating and building capacity. Incorporated in 2016, the foundation has trained hundreds of women and children- and some men by empowering beneficiaries with several business development skills. She is a humanitarian worker, wife, mother, and an advocate for a return to Positive family values using the social media to express her passion, because she believes that strong and stable societies emerge from positive family experiences. Amb. Unyime-Ivy is the convener of the Women Empowerment Skills Training (Project WEST), an annual skills training event and flagship program of SOW&G Foundation, which provides skills acquisition to women and girls. With the acquisition of these skills, most of the participants have set up micro business and have been able to attain a measure of independence and are on the way to being self-sufficient. Her work at SOW&G Foundation has been consistent and impactful. In 2014, Amb. 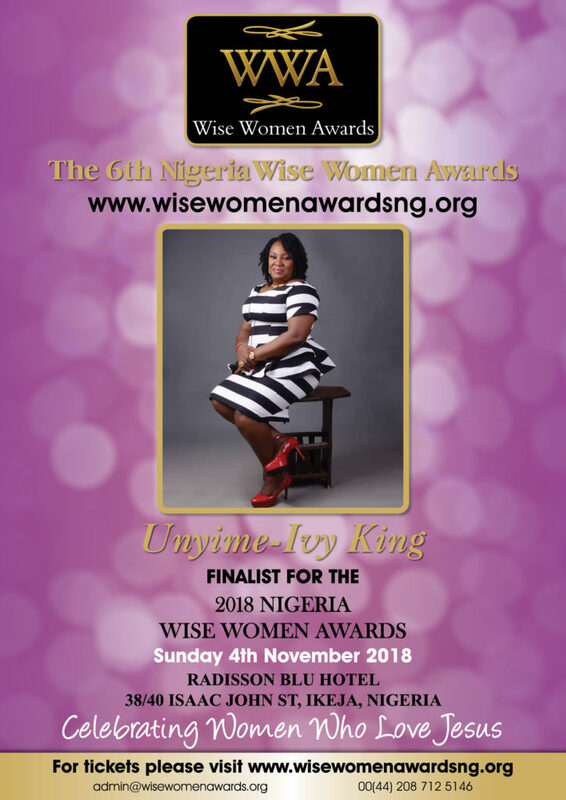 Unyime-Ivy King was awarded Eminent Ambassador of Peace with the United Nations under the auspices of the International Association of World Peace Advocates (IAWPA) and has spoken at UN conferences on issues that affect the girl child and the family institution as a whole. She was also appointed International Director, Gender Education/Advocacy by the International Association of World Peace Advocates (IAWPA). She is also ambassador of Nigerian Army School of Public Relations Institute, NASPRI and was The African Women in Leadership Organisation (AWLO), Akwa Ibom Chapter brand ambassador for the year 2015. Unyime-Ivy King is a graduate of the University of Uyo, Uyo, Akwa Ibom state with a Bachelor of Arts honors degree in English from the Faculty of Arts. A passionate God lover, she has served in different capacities in church- first in the Family Life Department of House on the Rock. She is married to her best friend and husband of 16 years, Ubong King, and lives with him and their four children in Lagos. Pastor Marjorie realised that no awards events exist within the Christian community that recognise women’s achievements. © 2019 Wise Women Awards - Nigeria. All Rights Reserved.